Learn how to effectively search, locate, evaluate and organise information from the Library. This module is designed for HDR students enrolled in OENG1085 Research Methods. Hi, Welcome to the Library Research Skills training module for OENG1085 Research Methods. OENG1085 Research Methods is offered to Masters by Research and PhD students in the College of Science, Engineering and Health. The course is coordinated by the School of Engineering. The Information Skills Module is a recommended module of OENG1085 Research Methods. To start, choose a topic from the side menu, or select from the links below. You can also use the next button at the bottom of each page to work through this module page by page. Look at the video introductions on each page for an overview of the content. Start here if you're not yet familiar with RMIT University Library resources and services. Identifying keywords, developing a search strategy, choosing your sources. Peer review, searching citation databases, finding theses and review articles. Referencing, EndNote, staying current with your research, additional help writing your literature review. Develop a systematic method of searching for information that can be applied to current research, writing a literature review, and other research needs. Become aware of the wide range of sources available for finding information and how to determine which sources of information will meet your needs. Develop your database searching techniques, including keeping up to date with the published literature after your initial literature search. 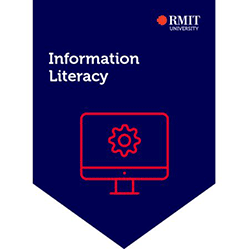 Become familiar with information resources available at RMIT and in other libraries. Cite bibliographic references using EndNote, the bibliographic management software provided by RMIT University. Use the exercises and quizzes to consolidate what you have learnt, and to think about how you will use your skills in researching and writing your Literature Review, Thesis and other papers. Acknowledgement to the Applied Sciences Information Research Methods tutorial for this content.